2018-19 Season Outlook: Should They Stay or Should They Go? It can't get any worse, right? This is always a dangerous assumption, but it's difficult to know where else to start with the Memphis Grizzlies. For a franchise which has spent the better part of the last decade (Grit 'n') grinding to stay in the championship conversation, the '17-'18 season was about as painful as it gets. It feels morbid to delve into the reasons for what went wrong last year; the 22-60 record just about says it all. Mike Conley's heel and Achilles' tendon injuries limited him to 12 games. The team as a whole was an absolute M.A.S.H. unit -- they gave regular season minutes to 24 different players, and only two players (Dillon Brooks and Marc Gasol) played more than 55 games AND averaged more than 24 minutes per game. Without Conley, the offense was a dumpster fire. They finished 29th in scoring (at 99.3 points per game), and it wasn't just because they played at the second-slowest pace in the league. They ranked 27th in Offensive Rating, 27th in FG percentage, 25th in 3-Point percentage, 26th in assists, 27th in turnover percentage...you get the idea. It was rough. About the only guy who could put the ball in the basket was Tyreke Evans, and the oft-injured University of Memphis product immediately parlayed his bounce-back season into a new one-year deal (and a significant raise) with the Indiana Pacers. And it wasn't like all the losing came with the silver lining of financial flexibility; the team had to trade occasionally useful forward Jarell Martin in July just to get under the luxury tax line going forward. Marc Gasol managed to stay mostly healthy in an even-numbered year, bucking a trend, but he's also 33 years old, and has started to show some signs of decline, especially on defense. He also appeared to pull an organizational power play last season, effectively getting head coach David Fizdale fired in late November, and he has a player option for the '19-'20 season, meaning he could be an unrestricted free agent after this season if he remains dissatisfied with the organization and wants to seek one last long-term deal. Any way you slice it, his time as a tent pole for the organization looks to be drawing to a close sooner rather than later. Chandler Parsons remains an injury-prone shell of his former self, and his cap-crippling contract (damn you, summer of 2016!) is fully guaranteed for two more seasons. Even amid all of this doom and gloom, though, there are reasons to be optimistic the team will rebound in '18-'19, and could even challenge for a playoff spot in the West. It starts, naturally, with the return of Mike Conley. All indications are he is ready to go for the start of the season, and a (mostly) healthy season from him would go a long way towards righting the ship. He has still yet to be named an All-Star, and his counting stats are generally not as impressive as some of the other Western point guards, but he is absolutely integral to the team's success, as his absence proved last year. He has missed 109 games in the last three seasons, so there is legitimate concern about his durability going forward, but he isn't historically injury-prone, having only missed 30 games in the seven seasons from 2008 to 2015. He is unlikely to ever live up to his gargantuan contract, but what's done is done, and a healthy, engaged Conley remains the linchpin to playoff contention over the next couple seasons. The silver lining of last season's pants-pooping is it netted Memphis the #4 pick in June's draft, which they used to select eventual Gasol replacement Jaren Jackson, Jr. While the JJJ bandwagon is quickly filling up with stat geeks ready to proclaim him the Stretch-5 Who Was Promised, the hype may well be justified. He is still incredibly young (as of this writing, he turns 19 tomorrow), so he may be further from a finished product than anyone else in the draft. He shot 51/40/80 in his lone season at Michigan State, so there is little reason to think his shooting stroke isn't legit. At 6'11" and 240 lbs, he moves extremely well laterally, and he uses his massive 7'4" wingspan effectively to alter and block shots. He was not a primary offensive option at MSU (though it certainly appeared he could have handled a larger role), which could turn out to be a benefit for a rookie looking to fit in on a veteran-laden team. He will need to cut down his foul rate to make good on his elite defensive potential, but that should come with time and maturity. 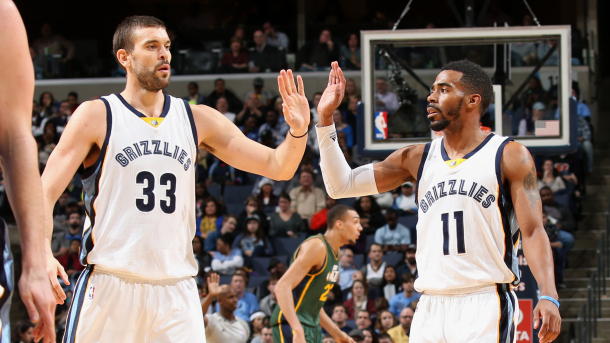 Outside of Jackson, the Grizz are not entirely bereft of other young talent, either. Dillon Brooks was a nice find in the middle of the second round in the '17 draft. He provided a rare dose of stability to an otherwise chaotic rotation last season, playing all 82 games and averaging nearly 29 minutes a night. Brooks clocked in as a league-average 3-point shooter on 3.2 attempts per game, which counts as a win amid all the bricky shooters they had soaking up minutes. He looks the part of a competent rotation player who will stick in the league, more than most teams typically get out of the 45th pick. Huzzah. Their 2nd round pick this season, point guard Jevon Carter out of West Virginia, appears to be another veteran upperclassman who should quickly find a spot in Memphis' rotation. His hard-nosed defensive style will undoubtedly endear him to Memphis' famously hardscrabble fans, and I suspect he will eventually bring a level of stability to the backup PG role which will render superfluous the signing of veteran journeyman Shelvin Mack, as well as the very existence of consistently sub-replacement level Andrew Harrison. At 6'2" and already 23 years old (seriously, it felt like he was in college for a decade), his ceiling may be low, but he should help to solve the ongoing problem of how to stay above water in the non-Conley minutes. Over the last three seasons, when Conley has been out of the lineup (either on the bench or injured), the team has performed worse by 7.7, 7.5, and 6.9 points per 100 possessions. Of course they need Conley to stay healthy and play the majority of minutes, but it would certainly be a big lift if those backup and spot starter minutes (given Conley's track record of injuries) could at least approach a baseline level of competence, and Carter should be able to provide that with his non-stop motor and high basketball IQ. Outside of sucking their way into the Jackson pick, the team's best personnel move was probably signing Kyle "Slo Mo" Anderson to a sneaky-good, 4-year/$37 million deal in free agency this summer. Due to his well-chronicled lack of foot speed and his tendency to blend into the machine in San Antonio, he often gets overlooked for the things he does extremely well, namely, make good decisions with the ball and play quietly excellent defense. He has improved each year, and did a nice job in an expanded role last season with the Spurs due to Kawhi's extended, bizarre absence. He is likely never going to be a big scorer because he lacks the pure athleticism and is only an average outside shooter, but even if his current level represents his peak, an expert, low-usage ball-mover and versatile, shutdown wing defender represents a big upgrade over the motley crew the Grizz have had manning the wings over the last few seasons. When the deal expires in 2022, Slo Mo will still only be 28 and will be making $9.9 million, so this contract has a chance to turn into a tremendous value as the cap continues to rise. It wasn't all candy and nuts in the personnel department. Losing Tyreke Evans and James Ennis in free agency hurt, as they were both useful wing players in a rotation which, even with Anderson in the mix, remains hamstrung by Chandler Parsons' turd sandwich of a contract and will be short on productive bodies this season. GM Chris Wallace attempted to patch this hole by trading for Sacramento wing Garrett Temple, a mostly nondescript minutes-eater who, for some strange reason (thanks again, summer of 2016!) will make $8 million this season for the same 20+ replacement-level minutes a night he always provides. On the plus side, the trade did rid them of toxic asset Ben McLemore, a major bust who simply appears to not have the mindset to reach the level his talent suggests he should. Getting off the $5.4 million they were set to owe a guy on his way out of the league counts as a win, even if it's technically redressing their own free agency mistake. However, Memphis may regret bailing prematurely on Deyonta Davis, who at 21 years old, remains somewhat raw and foul-prone, but actually put up intriguing per-minute numbers in 62 games last season. Davis inexplicably fell from a projected lottery pick all the way to 31st in the 2016 draft, so it's possible the front offices know something we don't know, and Lord knows tricking Sacramento into taking on your roster problems is an NBA tradition like no other, but dumping a young guy with so much upside (along with $1.5 million in cash and a future 2nd round pick, all of which are actual assets) for one season of a known quantity who makes $8 million and tops out at "well, he's not actively awful" feels more than a little desperate. They gave end-of-the-bench roster spots (and veteran minimum contracts) to MarShon Brooks (who had been out of the league for 3+ years before signing a 10-day contract with the team late last season), Shelvin Mack, and Omri Casspi, and if any one of those guys represents an answer in 2018, chances are you're asking the wrong question. It's easy to picture a scenario where Mack ends up stealing valuable backup PG minutes from Carter (along with coach JB Bickerstaff inevitably defending it to the media with some coachspeak-y nonsense like "Well, I just trust the guys who have been through the battles before"), and I'm already mad about it. In an ideal world, the team will run out a starting five of Gasol, JaMychal Green, Anderson, Dillon Brooks, and Conley, and fill out the rotation with Jackson (who could overtake Green by mid-season, depending to what degree he shows out early on), Temple, Carter, and either Wayne Selden or Chandler Parsons, depending on how committed they are to the charade that Parsons has anything left to contribute to an NBA team beyond living vicariously through his social media feeds. This may not look like a rotation ready to go toe-to-toe with the big dogs in the West, but if they get back to their defensive identity, Conley somehow stays healthy, and JJJ shows flashes, the whole could end up quite a bit greater than the sum of the parts. In any case, it should be good for a lot more than 22 wins, but this presumed improvement may raise more questions than it answers, especially if it isn't enough to garner a playoff berth. With Gasol about to reach the crossroads of his career and Jackson being the new potential franchise cornerstone, is it time for Memphis to blow it up? And even if they wanted to, could they? From 2011-12 through 2014-15, the Grizz averaged 53 wins a season [Note: I'm prorating the lockout-shortened '11-'12 season to a full 82 games for consistency]. The Grit 'n' Grind era peaked in '12-'13 with a 56-26 regular season mark and a trip to the Western Conference Finals, where they got swept by a monster Spurs team who somewhat famously came up one defensive rebound shy of winning the title. Even that season, 56 wins was only good for the 5th seed in the ever-loaded West, and Memphis has not reached those heights since, failing to make it out of the second round in any subsequent season. The team won 42 games in '15-'16 and 43 in '16-'17 before the bottom dropped out last year, leading many to the conclusion that the window of contention had closed (if it was ever truly open) and as constructed, the current roster is marching inexorably toward the dreaded treadmill of mediocrity. I don't really have a counterargument to this assessment; it more or less reflects the sad reality of the situation. If everything goes perfectly this year, the '18-'19 Grizz likely top out as first round cannon fodder. But maybe that's enough. Not every team can compete for titles every year, and the chips are especially stacked against a small market like Memphis. As the only major professional sports team in the city, the Grizz have a special civic relationship with the citizens (something Grit 'n' Grind tapped into in a very fundamental way), and it's important to continue to nurture that connection for the financial and spiritual health of both the city and the franchise. Wandering the NBA desert for a few years might be the healthiest thing in the long run for the state of the roster, but it would be a particularly bitter pill for the fan base to swallow. And even if management possessed the testicular fortitude to pull the ripcord, the teardown and rebuild would be fraught with challenges. First off, Memphis owes its 2019 1st round pick to Boston, courtesy of an ill-conceived trade for Jeff Green back in 2014-15 (incidentally, Jeff Green has already played for three additional teams since he left Memphis; his career is a fascinating study in how many franchises one player can irrevocably damage). However, Chris Wallace is not quite as dumb as former Nets' GM Billy King, AKA the architect of the single most damaging trade in NBA history. Wallace at least had the foresight to attach top-8 protection to the pick, so in our earlier best-case scenario, Memphis wins 40-some games and gives up a pick in the teens, taking its medicine early rather than risking losing a higher pick in the future. This outcome would count as something of a victory, because if the pick doesn't convey in 2019, it becomes top-6 protected in 2020, and unprotected in 2021. Woof. It would be quite the kick in the marbles to commit to a multi-year rebuild, only to be forced to hand over a juicy top pick to the Celtics (who will be busy competing for titles) right in the middle of it. The second problem would be how to handle the Gasol standoff. Again, Gasol is 33 and has a player option in his contract, making him a rapidly depreciating asset. If the team wanted to move on from him, the sooner they could make a deal, the better value they would get. If he is fed up and decides to exercise his "pre-agency" by demanding a trade, Memphis loses even more leverage. In any case, I suspect there would still be a market for him; "unicorn inflation" may be running rampant, but 7'1" guys who can defend, rebound, post up, run the offense from the elbow, and hit 3's still don't grow on trees. Whether or not the return is worth unceremoniously dumping one of your franchise's icons is certainly debatable, but how they manage the dynamics of the relationship with Gasol this season is going to be fascinating. Third, even if the team can find a beneficial resolution to Gasol's situation, they would still be saddled with the dual millstone contracts of Conley and Chandler Parsons. There is no such thing as an "untradeable" NBA contract (see Johnson, Joe), but man, would these be some tough needles to thread. Mike Conley is an undeniably valuable player, and there are probably contending teams who would be happy to have him, if only his salary cap figure were not so untenable. Keeping him around sabotages any potential tank job because he's too good; finding a trade partner involves a team (or teams) who are willing to part with the type of draft picks Memphis would demand, along with a set of contracts which make the math work without clogging up the cap sheet or substantively improving the roster in the process. Trying to get out from under Parsons' deal is even harder, though perhaps that's for the best. Getting off his salary would require giving up draft capital to another rebuilding team willing to rent out its cap space, which would obviously defeat the entire purpose. 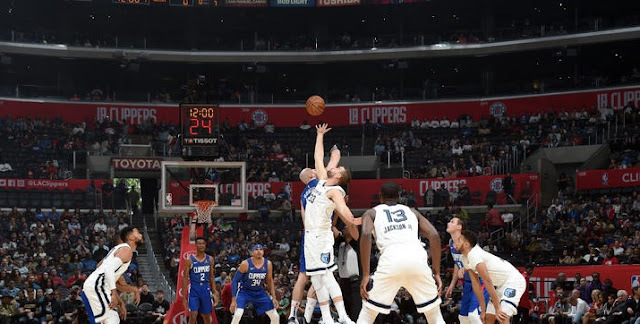 If the point is to lose games while giving the appearance of competitiveness, perhaps the best solution is just to play Parsons as many minutes as his decrepit knees can handle. He's obviously a sunk cost; might as well make him earn his money, even if it's in the most perverse way possible outside of Tijuana. Memphis would be far from the first team to pull this stunt. I suspect Chris Wallace and owner Robert Pera will opt for the status quo, though things could change quickly if the team struggles out of the gate and the Gasol melodrama proves to be irreconcilable. Nearly a decade of successes and failures have led the Grizzlies to this crossroads, and to the existential question: is it worth holding onto your past, even if it might cost you your future?